Mobile is as personal as it gets. That’s why people feel annoyed when mobile ads delivered to their devices and apps are a mismatch with their desires and expectations. To cut out unwanted noise and shut out ads that deliver a poor user experience, consumers are reaching in record numbers to mobile ad-blocking technology. Unfortunately, bad ad experiences don’t only alienate and frustrate consumers; they also deprive publishers of an important chance to monetize their assets and audiences. So, what is a bad ad experience? Unsurprisingly, ads that disrupt or distort content people are trying to read or enjoy lead the list of most “hated” annoyances, according to research from Nieman Norman Group. Pop-up ads, auto-playing video with sound, interstitial ads that must be viewed before content can be viewed, and postitial ads that obscure the content or just breaking the browsing flow are ad approaches and formats that people want to avoid. Naturally, in the Age of Personalization—marked by milestone studies that reveal 78% of consumers said they would be happy to receive mobile advertising that is relevant to their interests—mobile ads that are out of sync with people’s interests and context are also a “fail.” However, this doesn’t appear to deter publishers and brand marketers from plowing huge amounts of money into mobile ads that people ignore. It’s a dynamic that threatens to bankrupt the entire digital ecosystem. 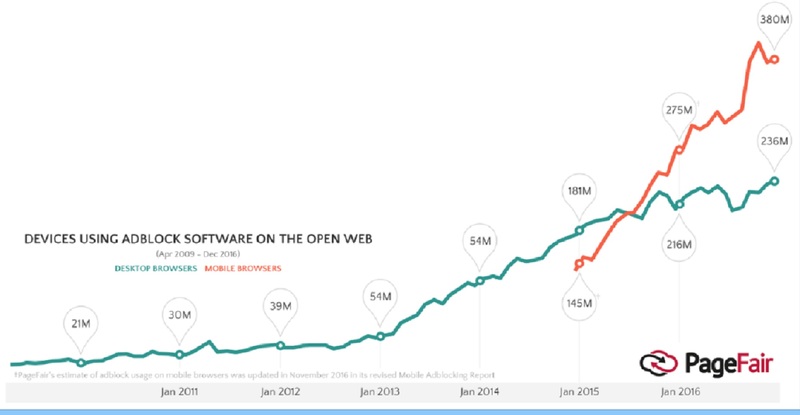 At one level, mobile ad spend is rising into the stratosphere. Research firm eMarketer reckons ad spend in the U.S. alone, which accounted for 66% of all digital ad spend in 2017, will increase to 72% (or $65.8 billion) in 2019. At the other end of the spectrum, the vast majority of brands and publishers are wasting budget ads that fail to inspire or influence consumer behavior. Only one in ten respondents (11%) believed their mobile ads were genuinely helpful. This figure increased significantly with the quality of the mobile ad experience. While just 17% said they were “likely” or “very likely” to interact with a generic ad on their phones, over twice that number (38%) said they would do so it the ad was related to their interests or hobbie. And 34% said they would engage if the ad was related to where they were at that particular time. Lack of relevancy is part of the problem, lack of imagination is the other. A 2017 survey of 100 advertisers and 1,000 consumers regarding their recent experiences and preferences toward mobile ads conducted by Forrester Consulting and commissioned by digital advertising creative management platform Celtra found that poor creatives may be at the core of bad ad experiences. Vendor spin aside, the data suggests positive mobile ad experiences promote positive consumer perceptions and influence actions. The findings also support my personal view that the ability to craft and evaluate effective mobile ad and in-app creatives is at the core of what marketers must learn and master to ensure their campaigns move the needle, not miss the mark. Effective marketers follow the data to determine what works. “But it’s not just about amassing Big Data,” Haydon Young, Director of User Acquisition at Dots, writes in an insightful post. “It’s about creating a Big Picture view of your users by blending what you know about them in the digital world of mobile and apps with what you observe about them in the “real world”. He recalls how a re-think of ad creatives rocketed conversion rates for Covet Fashion – an app for fashionistas and the shopping obsessed. Observing shoppers in real-life, at malls and shops, helped his team architect an ad experience catered to its unique audience demographics (“moms, daughters, sisters, aunts, grandmothers, and everything in-between”). It allowed them to align with their aspirations (“a vast and diverse group of races and body types united by the singular desire to be a part of the fashion and beauty world”). Rather than use ad creatives that depicted super-models, he removed the faces altogether. This encouraged users to picture themselves in the clothes and look they wanted most. The creatives worked because they spoke to the audience ambition to be and look amazing. The takeaway: Ad creatives succeed when they address audience demographics and desires and encourage people to unlock their real potential. It’s no coincidence that brand creatives “rooted in real life” are crushing it, according to the Global Marketing 2018 Trends study from Freedman International. From fashion brand ASO that refused to photoshop models in its ads to Fitbit that has switched from using professional athletes to showcasing average people working out, companies are winning audiences with imagery that portrays the real world as it really is. Authenticity is a must across the entire ad experience. Be upfront about what your app offers and choose mobile ad creatives that are descriptive, not deceptive. Even the coolest creatives won’t appeal to everyone in your customer base. So, use data to develop effective segmentation and targeting strategies. “Ad copy and images may perform differently depending on user demographics, operating systems, and interests,” Trompeter explains. Choosing the right creative for the right audience is an ongoing task that requires the discipline to test and the courage to innovate. It can be a daunting task, but Trompeter tells me there are some shortcuts. Dynamic ads and creative templates can remove a lot of the heavy-lifting, making it easy for marketers to mix and match hundreds of creative variations to ensure mobile ads are fresh, relevant and engaging. Trompeter achieves this by applying what she calls the “80/20 rule.” In practice, she runs “about 80% of budget toward historical performers and 20% toward testing.” It’s a smart approach that recognizes the hard truth about effective advertising. Marketers have to focus ad spend on what is proven to work. However, they also need to experiment with ideas and ad elements that take them outside their comfort zone. Verve Foundry can use part of the screen or all of it to create an animated experience. The days of using the consumer’s mobile device as a “launching pad” for ads that disrupt and annoy are over, Geer says. “The future is about creating an opportunity that is cohesive to the device and using the data to ensure mobile ads deliver the right opportunity and one that is relevant to the individual.” This is also where ad formats that “augment and enhance user activities” play a major role, enabling a positive brand experience and driving closer customer connection. Effective and emotive mobile ad creatives are a huge departure from the annoying screen-takeovers and one-size-fits-all ad experiences that characterized the early days of digital marketing. Stronger creatives, real-life imagery, and innovative formats that push the envelope point the way to positive ad experiences that will engage, motivate, and activate consumers. Mobile is changing the way we consume video online. No, this doesn’t just mean that they are watching more video on mobile. 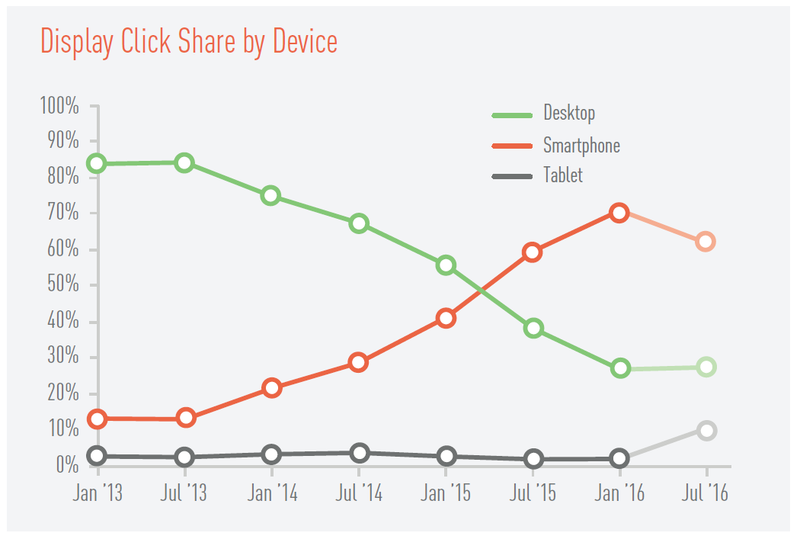 Mobile viewing behavior is impacting a lot more than you might imagine. In fact, MediaBrix ran an experiment which found that less than 30% of people turn their phone to view horizontal video ads, and when they do, they only watch 14% of the ad. So how are publishers reacting to this? In our own study, we found that many have shifted their focus to vertical video. They’re realizing that this method is more user-friendly, and better accommodates the way people take in video on smartphones and tablets. Here’s a full overview of what we discovered. More than 100 Media Properties Ran Vertical Video. For publishers, vertical video ads have become more prominent than ever before. In Q1 of 2017, 112 mainstream and mobile websites ran vertical video advertisements. While still low compared to the entire media landscape, it’s a new industry-high. This is the result of barriers to entry. Those running vertical video tend to be more sophisticated, with enough financial resources to fund innovation. This includes divisions at Hearst, Conde Nast, and Time Inc., as well as Vox Media, AOL, Business Insider, and NBC Universal, according to our data. Most Vertical Video Ads are 15-Second Spots. Per our analysis, roughly 70% of vertical videos are 15 seconds in duration. As with many new formats, there’s a lot of testing in video duration. For example, MFS Investment Management is running this 90-second ad, while others are staying short at 5 seconds, such as this avant-garde ad by CHANEL. The majority, however, are running 15-second spots. This is interesting since Snapchat, a vertical video leader, has a current max of 10 seconds. Movies and TV programming represent nearly 40% of all vertical video ads online. In second and third place – though far behind – are apparel at 9% and retail at 7%. Marketing for TV programming and film has adopted vertical video the most aggressively, with dozens of examples, ranging from Patriots Day to Taboo. This lopsided adoption indicates that there is massive potential for this format. Our report shows that vertical video ads are steadily becoming more popular among publishers as consumption and mobile usage increases. It will be fascinating to see how publishers’ use of vertical video evolves in the second half of the year and beyond. Mary Meeker’s annual Internet Trends Report is often referred to as the state of the union for the media and technology industry. In it, Meeker—a partner at venture capital firm Kleiner Perkins Caufield and Byers (KPCB)—highlights the biggest internet developments for the coming year. Her report provides insights on digital adoption, identifies which interfaces are resonating, and examines the dynamics of ecommerce. Mobile dominates digital usage. U.S. adults now spend 5.6 hours a day using digital media, 3.1 hours (from 2.8 in 2015) via mobile devices and 2.2 hours on desktop and laptop. The ad spend on mobile is not proportionate to the share of time spent on mobile. While consumers spend 28% of their time on mobile, only 21% of the digital ad dollars is spent on mobile media. This is expected to correct itself in the second half of this year. 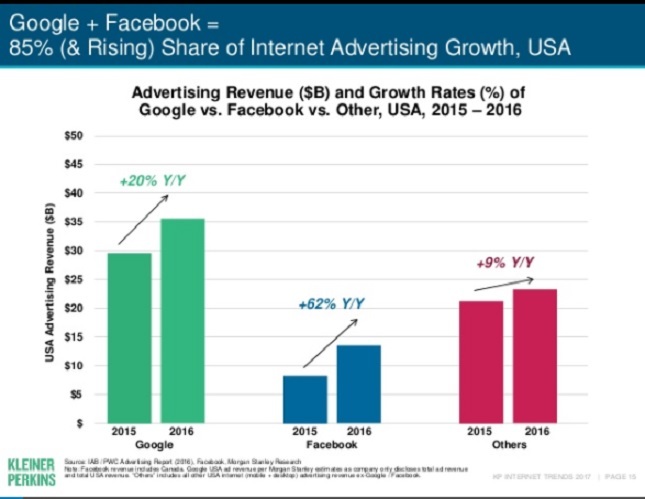 As internet advertising continues to increase, the growth is concentrated in Google and Facebook, the internet duopoly. Meeker’s report notes that Google and Facebook control 85% of online ad growth. Google’s ad revenue grew 20% and Facebook 62% in 2016. For everyone else, the growth was less than 10% year over year. Internet users are concerned about their privacy and security online. Consumers report being concerned with how their data is being collected, used and stored. Consistency and self-regulation of privacy policies are important steps in the monitoring the Internet ecosystem. Voice recognition software and devices such as the Amazon Echo and Google Home are reshaping the consumer digital experience. In fact, Amazon Echo is now installed in 11 million households in the U.S. Further, 20% of all mobile searches are now voice activated. Gaming goes mainstream. There are now 2.6 billion gamers today compared to a 100 million in 1995. In fact, viewing time for eSports, professional video gaming live-events and tournament, increased by 40% compared to a year ago. The gaming revenue concentration remains in Asia, with 47% of 2016’s $100 billion global market. Meeker believes video gaming’s socially engaging features will offer new businesses opportunities and sporting events. Streaming music helps revives the music industry. Spotify, the marketplace leader, exceeded physical music sales, adding to the first revenue growth in the music industry in the last 16 years. Free trials are also driving sampling and subscription sign-ups. Healthcare data is flowing with approximately 25% of U.S. consumers owning a wearable device, up 12% from a year ago. Further, 6 in 10 people report they are willing to share with health information with Google. Collecting and analyzing healthcare data has huge implications for the medical and healthcare sector from aiding clinical trials to identifying geographical and environmental healthcare concerns. The marketplace is rapidly advancing and continues to grow in importance. According to Meeker, the top 20 Internet companies—many of which were not around before 1995—have a market value of nearly $3 trillion. New media platforms and information technologies are transforming new market economies. Yet it is important to note that Meeker sees new opportunities across multiple platforms to connect and add value for consumers. If a mobile ad is displayed, but not viewed by a human or simply not rendered properly, does the advertiser pay? The answer is yes, but two top advertising trade groups are working to establish a standard that will address this wastage and ad fraud through a uniform means of tracking whether ads can be seen in mobile apps. Viewability is a huge headache on mobile – where the variety of ad formats and the way consumers interact with them (scrolling in a newsfeed, not clicking individual banners, for example) makes it a difficult one to call. To complicate matters, both Flash and cookies – URL referrers and trackers that are ubiquitous across all major desktop browsers – are completely absent from mobile. Moreover, the mobile ad ecosystem of buyers and sellers is, in itself, a bottleneck. While ad buyers insist on purchasing only mobile ads that people can actually see, many publishers are less eager to lift the lid on this data. Their reluctance can be linked to that fact that impressions (CPMs) not click-throughs (CTRs) are the measurement that defines their business and their bottom line. Currently, tracking ad viewability on mobile apps is a complicated process as app developers and publishers must integrate software from multiple third party providers. It’s a process that costs resources and – more importantly – can slow down the app. This is critical as a recent HP- sponsored study by Dimensional Research shows that most consumers quickly lose patience, and will even delete, apps that take longer than 2 seconds to load and perform its actions. The result is a trade-off between viewability (for the advertiser) and usability (for the consumer). To strike a needed balance the American Association of Advertising Agencies (the 4A’s) and the Interactive Advertising Bureau (IAB) have thrown their support behind an open source initiative aimed at standardizing viewability measurement for mobile apps. The goal is to jointly develop a single code base that mobile publishers can plug into their apps, letting advertisers pull data on viewability in a standard fashion, Joe Barone, managing partner of digital ad operations for GroupM and chairman of the 4A’s Digital Operations & Technology Committee, told the WSJ. The organizations will oversee efforts to develop a standard tracking code, with the input of various constituencies from across the ecosystem. “This will be a very regimented, very democratic process,” Alanna Gombert, general manager of the IAB Tech Lab, told the WSJ. The initiative comes at a time when concerns about ad viewability and accountability in the industry are high, magnified by a string of serious miscalculations by Facebook. The mobile ad giant has publicly admitted to overstating or understating the metrics that publishers and advertisers use to measure ad effectiveness on the platform and the value of Facebook ads. It’s important to have Facebook and Google, which account for 85 cents of every new ad dollar spent on digital, on board, but it remains to be seen if thy will adopt and implement third-party tracking code of any kind. While there is growing need for a consensus on viewability tracking, and a single code to enable it, change may come slower than we think. Many ad buyers and publishers prefer to work with their preferred vendors to track and calculate ad effectiveness. Moreover, the vendors behind these technology solutions worry an open source approach would effectively replace their proprietary tracking code and potentially devalue their companies. Each year the mobile ad industry introduces new creative formats. These formats, both new and old, play an important role in the user’s experience and impact advertising effectiveness. To understand each ad format effect, Kargo, a mobile advertising platform, partnered with MediaScience, a neuroscience research firm, to analyze consumers’ responses to four mobile ad formats through their eye movements, biometric responses and attitudinal changes. The research found that bigger ad formats are not always better on mobile and In-Stream and Sidekick ad units offer both strong consumer appeal and higher ad effectiveness. Interestingly, while Interstitial ads appear to offer higher brand recognition than Adhesions and Sidekicks, they also over-indexed as disruptive, annoying and intrusive. Adhesion units (adheres to the bottom of the screen and stays with users as they scroll down the page) are viewed as the most common mobile ad unit, and are easily avoided by users. While Adhesions are perceived as less intrusive than Interstitials, they received much less visual attention than all other tested ad formats. In-Stream units (appears within the stream of editorial content) provide users with the opportunity to focus on mobile ads at their own discretion. In-Stream units perform similarly to Interstitials in visual attention, but outperform them in visual retention. In-Stream units are not thought of as disruptive, annoying, or intrusive. Interstitial ads (served between content pages) appear to have received the most negative biometric response and negative ad evaluations. They are viewed as disruptive, annoying, intrusive and not well-placed. Kargo’s Sidekick unit (a silhouette appended to the side of the screen, provides continued visual attention) performed like the other ad formats in visual attention without annoying the user. 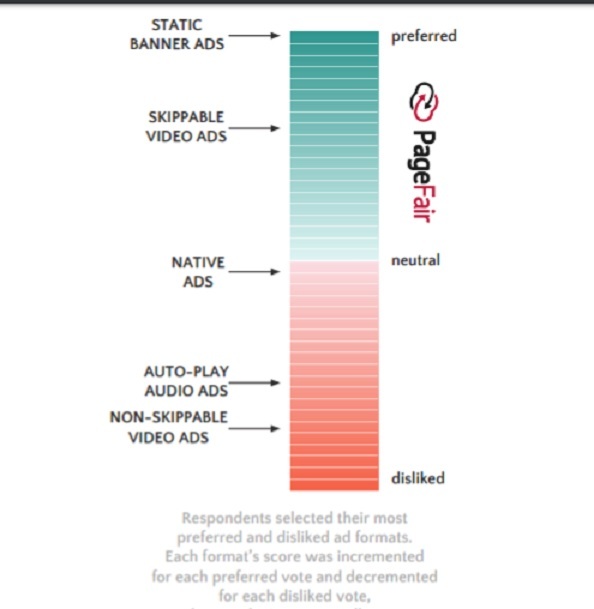 The Sidekick ad unit, like In-Stream, ranked best among users in terms of overall liking of the ads. Overall, results of this study suggest that In-Stream and Sidekick units may be the most effective for mobile advertising, among the four ad formats. Both ads hold visual attention and are memorable without the intrusiveness of Interstitials. It’s important to connect both the rational and emotional appeal so the ad attains positive attention and offers users the freedom of managing their environment. Mobile isn’t just causing a seachange in consumer behavior by increasing our demand for formats and features that are easy and enjoyable to access on smartphones and tablets. 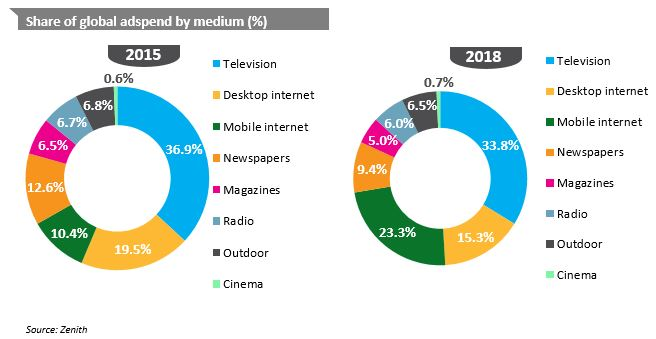 Mobile is also causing a seismic shift in advertising spend allocation, a surprise trend documented in the Zenith Advertising Expenditure Forecast released earlier this month. The forecast, upgraded from numbers the company published in June, still expects mobile advertising to overtake desktop–but the new forecast predicts this will happen much sooner. In fact, forecasts for mobile growth this year are upgraded from 46% to 48%, and next year from 29% to 33%. While it may only amount to a few percentage points, the impact on the total is tremendous. Zenith now expects mobile ad spend to exceed desktop by $8 billion in 2017, up from the $2 billion that was predicted in June. Overall, desktop is going to suffer a steep drop in 2017 – one from which it will not likely recover as Zenith further forecasts mobile to account for 60% of all internet advertising in 2018, up from it’s previous forecast of 58%. Why is the shift to mobile causing desktop advertising to shrink faster than newspapers, magazines and TV? The answer is inextricably intertwined with consumer behavior and people’s preference for experience over interruption. At one level, mobile ad spend is merely following the trajectory it must if brands and marketers are determined to be where their customers are. People are spending more time on mobile devices, so ad dollars must follow. This brings us back to the most “clipped” slide in the annual Mobile Internet Trends Report deck from Mary Meeker, Internet guru and partner at venture capital fund Kleiner Perkins Caufiled & Byers. 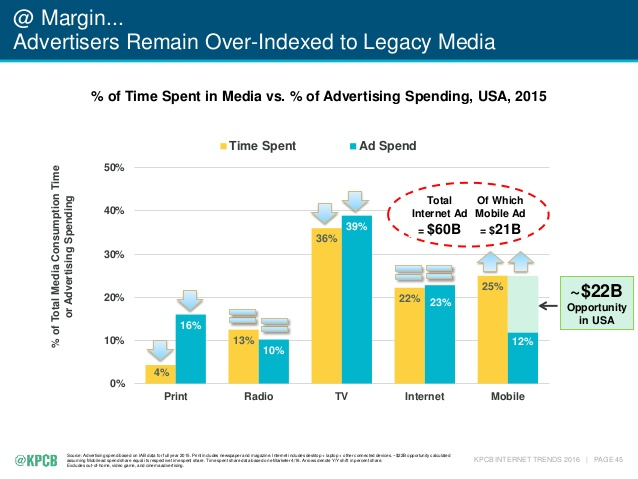 In it Meeker pointed out the gap between time spend on media (specifically mobile) and percentage of media spend. But the exodus of ad spend is also fueled by the hard truth that consumers are annoyed by banner ads, and reaching in increasing numbers to ad blockers in order to tune out interruptive display advertising on desktop (as well as mobile). Another driver causing the rapid decline of desktop ad spend in no doubt the surge in social media and native advertising. Reams of research and campaign results shows social and mobile is an unbeatable combination–particularly since social media is a perfect fit with the fiercely personal nature of our mobile devices and aligned with how we spend the majority of our time on mobile (namely, engaging in social media conversations and the contextual ads that show up in our feeds). In a world where experience trumps–well– everything, all ad formats can count on being a line on the budget as long as they are highly engaging, not annoying, and highly relevant. It’s a relief for consumers and a worry for publishers: Google is cracking down on interstitial ads on mobile websites, thereby forcing publishers to rethink and revamp their mobile advertising strategies. And while the rationale might be good for Google and the ecosystem, it is worrying that the tech giant has so much power to act unilaterally. These pop-ups, which publishers typically use to get a visitor to “like” a page on Facebook or sign up for a newsletter or serve an ad, for example, have become nearly ubiquitous across websites. Online publishers rely on them to help generate more subscribers or ad conversions. On mobile devices, where screens are smaller, these interstitials sometimes take up the entire screen, making users hunt around for a way to close them. To be clear, not all interstitial ads will be penalized. Google has outlined the specifics of what it will deem appropriate versus obtrusive. Interstitials asking for age verification or permission to utilize cookies on a device are fine if used responsibly, as are banner ads that only take up a “reasonable amount of screen space,” according to a blog post by Google. But other commonly used ads that make content inaccessible, such as a pop-up that covers the main content of a website, or an interstitial that blocks the page unless a user closes the ad, are a no-no. It’s an example of just how much authority Google has when it comes to advertising, as lower search rankings lead to less traffic on a website. But of course, more traffic—and the revenue that comes with it—is precisely what publishers and online operators want. So with this new scheme set to go into effect, using interstitials is tantamount to a lose-lose situation, as “Google’s continued nudges could make a difference in the long run,” according to The Verge’s Jacob Kastrenakes. The company had previously issued a penalty in November 2015 for the interstitial ads that asked users to install a mobile app, and is now somewhat rolling that penalty into this new decree. The study also showed that these ads were a hit with certain target audiences, namely Millennials. Forty-four percent of Millennials who viewed the ad reported positive feelings about the way the ad revealed itself, compared to 31% of those age 35 and over. Moreover, “while women saw the larger brand increases, men were much more impressed with the scroller’s look and feel,” according to the IAB. Given that mobile advertising spending in the U.S. will increase by 41% this year and constitute 72.2% of all digital ad spending in 2019 (to become a $65.87 billion industry), publishers can’t afford to use ads without thinking of the big picture. But with smart and strategic understanding, publishers should be able to roll with Google’s changes. In fact, it might just push publishers onto better methods.